The Linux kernel I/O schedulers attempt to balance the need to get the best possible I/O performance while also trying to ensure the I/O requests are "fairly" shared among the I/O consumers. There are several I/O schedulers in Linux, each try to solve the I/O scheduling issues using different mechanisms/heuristics and each has their own set of strengths and weaknesses. For traditional spinning media it makes sense to try and order I/O operations so that they are close together to reduce read/write head movement and hence decrease latency. However, this reordering means that some I/O requests may get delayed, and the usual solution is to schedule these delayed requests after a specific time. Faster non-volatile memory devices can generally handle random I/O requests very easily and hence do not require reordering. Balancing the fairness is also an interesting issue. A greedy I/O consumer should not block other I/O consumers and there are various heuristics used to determine the fair sharing of I/O. Generally, the more complex and "fairer" the solution the more compute is required, so selecting a very fair I/O scheduler with a fast I/O device and a slow CPU may not necessarily perform as well as a simpler I/O scheduler. Finally, the types of I/O patterns on the I/O devices influence the I/O scheduler choice, for example, mixed random read/writes vs mainly sequential reads and occasional random writes. Because of the mix of requirements, there is no such thing as a perfect all round I/O scheduler. The defaults being used are chosen to be a good best choice for the general user, however, this may not match everyone's needs. To clarify the choices, the Ubuntu Kernel Team has provided a Wiki page describing the choices and how to select and tune the various I/O schedulers. Caveat emptor applies, these are just guidelines and should be used as a starting point to finding the best I/O scheduler for your particular need. In the above example, the program "wobble" was started and forks off a child process. The parent then renames itself to wibble (indicated by a turning arrow). The child then segfaults and generates a core dump (indicated by a skull and crossbones), triggering apport to investigate the crash. After this, we observe NetworkManager creating a thread that runs for a very short period of time. This kind of activity is normally impossible to spot while running conventions tools such as ps or top. 2. 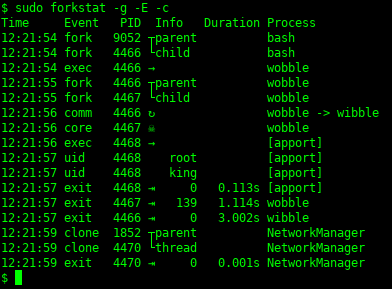 By default, forkstat will show the process name using the contents of /proc/$PID/cmdline. The new -c option allows one to instead use the 16 character task "comm" field, and this can be helpful for spotting process name changes on PROC_EVENT_COMM events. These are small changes, but I think they make forkstat more useful. The updated forkstat will be available in Ubuntu 19.04 "Disco Dingo".